First, a datasource needs to be created. You need the database schema’s datasource configured to create the JNDI connection information needed to access it. If all you want to do is to access the data from ADF, this is all you would need. Where the database adapter comes into play, however, is when your project’s composite needs to access it as a service (e.g., when a composite’s Mediator needs to connect to the database adapter). In the fourth part of this series, the Database Adapter SOA component will be dragged into the External References column of your composite diagram. For this to succeed at runtime, the datasource’s JNDI connection to the datasource has to first be added to the database adapter’s DBAdapter deployment. This will be done in part 3 of this series. 2. In this step, the source of the data is configured as a datasource to the SOA infrastructure. This datasource provides the connection to the actual underlying data provider. 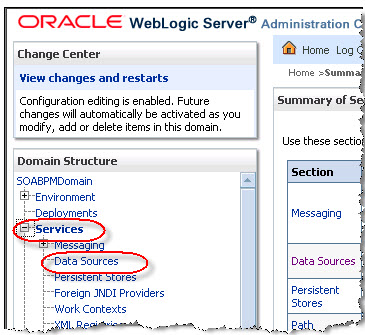 Configure the JDBC Datasource in the WebLogic by selecting Services -> Data Sources. Read the complete article here.